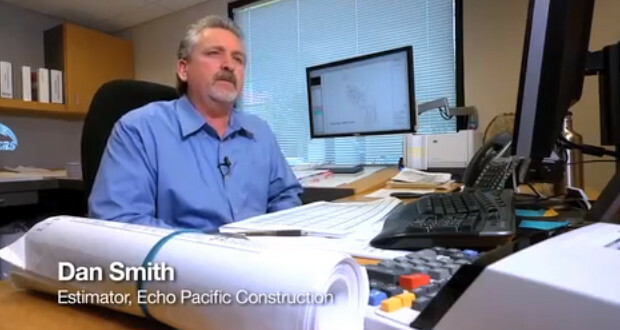 Hear from Echo Pacific Construction, a San Diego construction firm focusing on public works construction, and how they cut their estimating costs in half and increased efficiency by 75% by using Sage Timberline Office Estimating. Estimates that used to take 4-5 days now take 4-5 hours. Echo Pacific Construction, Inc. is a midsized construction company with annual revenues averaging $100 million. The company specializes in public works projects across the state of California. A perennial award winner with Associated General Contractors and Associated Builders & Contractors, the company was named Contractor of the Year in 2007 and has been an Excellence in Construction recipient for three of the past five years. A factor in the success of Echo Pacific Construction is its lean operation that can react quickly to accommodate changes in the marketplace. Supporting the company in its success is Sage Estimating*. Alliance Solutions Group provides Computer Software and training for Construction and Real Estate with specialized solutions for Commercial and Industrial Contractors, Electrical and Mechanical Contractors, Residential Builders, Real Estate Developers, Real Estate/Property Managers and Corporate Owners and Government. Alliance is a Sage authorized partner.